It takes a certain eye to look at an abandoned industrial building, almost a thousand feet long and six stories tall, but only 60 feet wide, and say to oneself: ”that’s the perfect location for a data center.” Yet that is just what the minds behind Pennsylvania’s Keystone NAP did, selecting the motor building at the center of a former steel works as the primary location for its new facility. Building a data center on the repurposed steel mill site has had a lot of advantages. The entire site has significant security in place, with controlled access not just to the data center but to all of the other businesses that have moved into existing buildings and new constructions. There are no neighbors who might complain, and in an area designated for heavy industry, there are few businesses with a lighter footprint than a data center. The location also still supports the power infrastructure that could drive a huge steel mill facility. Though the current power capacity of the building is 32MW, there is more than 2000MW available on site, from four separate power generation facilities. Even better, those four facilities use four different fuel sources: one draws methane from an adjacent landfill site, one uses a trash to steam plant, one is dual fueled with coal and natural gas, and the last is on a natural gas pipeline that feeds across the Delaware River, adjacent to the site. There is an electricity substation next to the data center building, and Keystone actually has a contract to maintain power distribution to other properties on the site as well as its own. A complete network of high tension power lines runs throughout the site, allowing for power to be delivered to any location. 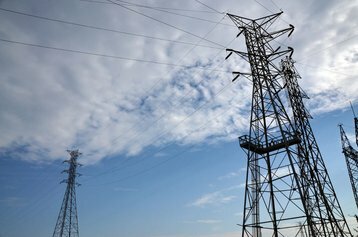 Keystone took advantage of the existing tower network to build a fiber network for the data center and other tenants of the former steel plant. One downside of the river and landfill is a large population of seagulls congreating around the site, but the site owner has successfully contracted for birds of prey to scare them off. The aerial view of the site predates Keystone’s arrival, and shows there was definitely some work to be done to get the site ready for use as a data center. 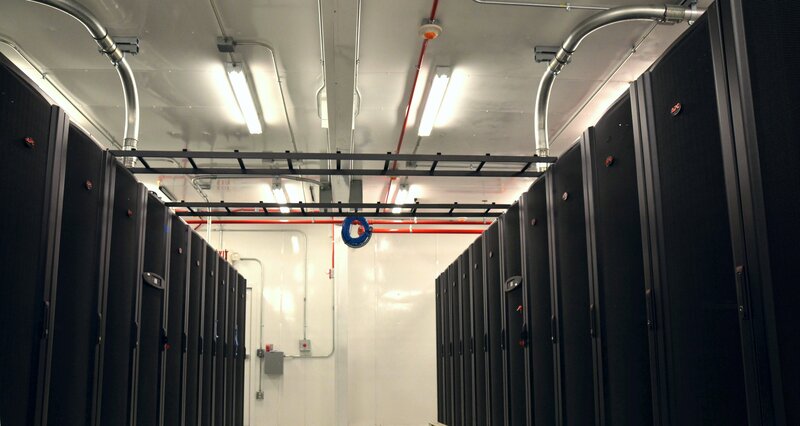 The basic appeal of the site was clear: the long open space is ideal for stacking Keystone’s signature Keyblock modular data center containers, designed in conjunction with Schneider Electric. The floor, five feet of reinforced concrete, could easily support the weight of modules stacked three high. Under that floor the basement made it practical to run the power below the surface, and both power and fiber lines are also buried locally outside the building. UPS and backup generators are also modular, being installed externally to the main facility, in modules set up perpendicular to the building roughly 100 feet away. The facility, though it has commissioned its first data center modules, is actually still under construction. The entire roof has been replaced, but the final 100 feet or so of the building still had open walls when we did our walkthrough. Being open to the elements hasn’t stopped Keystone from getting those first nine modules up and running with the module deployment and commissioning occurring simultaneously with the completion of the building. Citing security concerns, Keystone was unwilling to allow photographs of the in-process construction. Images appearing with this article were provided to us exclusively by Keystone NAP. It’s the modules that allow in-process commissioning. Designed in conjunction with Schneider they are built by Schneider at a facility in North Carolina and delivered by truck to the site. The Fairless site also has a working port operation, so, should it be necessary, modules could be delivered by barge. Delivery time for a new module, from contract signing to installation of the IT equipment on site, is 90 days. Keystone has 80 acres of space available for expansion, which could hold a huge number of Keyblocks, well beyond the likely near-term demand. The design of the modules specifically allows them to be stacked and bolted together to make a solid structure; the facility is projected to hold up to 100 of the current modules. To place and stack the modules, a tracked overhead crane system capable of supporting up to 50 tons has been installed. The default configuration for the modules sees a floorplan split between two sections. First is the main section with 22 racks configured for hot aisle containment with 11 racks on each side of a central aisle. 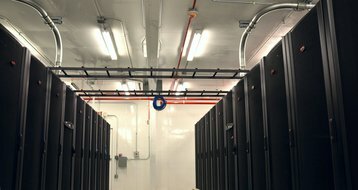 The current design supports 400 watts per square foot, but customers can configure higher density solutions with some changes to the modules’ internal rack layout. The rear of each module is blocked by an access controlled wire mesh divider, with the air handling equipment on the opposite side from the IT equipment. There is also a back door, accessible to Keystone staff who can then maintain the air handling equipment without needing to access the customer’s IT equipment. While the front of the stack of modules has a metal deck and stairs to each floor, access to the rear doors is handled by a mobile scissor lift, making casual accessibility unlikely. Future module designs look to make the air handling external to the IT load module, removing the necessity of any non-IT access to the modules. With access to many major carriers and dark fiber, the Keystone location, with its low-latency and support for synchronous communication between both Philadelphia and New York City, as well as the region in between, is suitable for both the development of primary data centers as well as back up and disaster recovery sites for companies in that geographic region. Walking through the building you get a curious sense of what was once there. There are with large steel plates embedded in the floors, and odd symmetrical cuts in the concrete, clearly made to anchor large machinery. With only the first nine modules installed (three stacks of three), looking down to the other end of the building you can barely make out the other end of the structure, even in broad daylight. But the entire structure gives a sense of the movement of business in the United States, from a producer of vast quantities of steel to the creators of technology and a very different path to tomorrow.